After a long winter slumber we all long for some colour and life in the garden. Spring bulb planting begins in September but save your tulips to be planted in November. Plant them to early and there is the possibility of them suffering tulip fire. To get the greatest impact plant spring bulbs in drifts. Here are some of Couture Gardens favourite spring bulbs. These dwarf narcissus grow from 10-15cm tall. They are golden yellow and make a fabulous spring show grown in clusters all through the borders. They are excellent for window boxes. These narcissus are not only multi-headed but scented also so you get more bang for your buck. The flowers are snow white and have a daintiness to them. They grow to 40cm high. 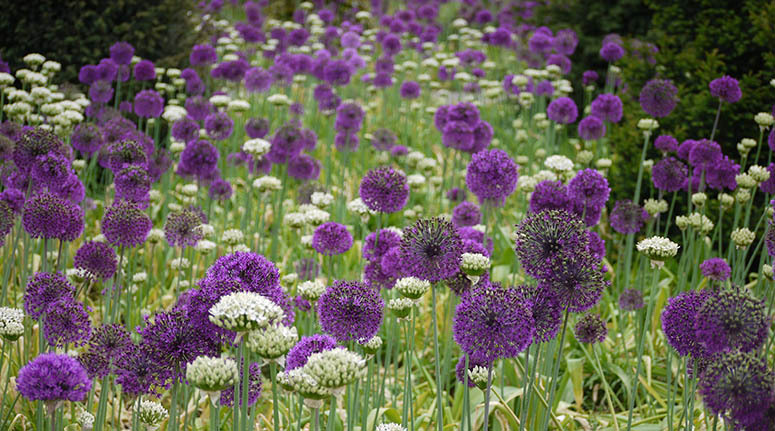 The flower of this allium can only be described as a firework. The stems of each flower vary in length. Plant among emerging herbaceous perennials to hide the tatty leaves. Grows to 50cm high. Small rosy-purple flowers that grow into a pompom. These are best planted in between emerging herbaceous perennials as the leaves tend to go tatty before the flower stems appear. Grows to 90cm. The seed heads also look beautiful. This is a star woodland plant, which will multiply in time. Plant under deciduous trees. The mauve-pink flowers rise from heavily mottled leaves. Grows to 15cm in height. Our advice is to buy in the green. A lily shaped rosy-pink tulip that flares out into a goblet shape. Grows to 50cm high with slimmer stems but still sturdy and make excellent cut flowers. A scented tulip in sunset orange with a reddish purple flame through the middle of every flame. It is a sturdy tulip growing to 30cm high so it makes it good for windy conditions. This is a stunner with a dramatic flower bud that grows into a huge rosette of bluey violet starry flowers. They grow to 25cm high. Not a cheap bulb but definitely worth the money. Not a bulb but a rhizome that will naturalize over time. Perfect to grow under a large shrub or small tree. Produces large open pale lavender flowers. They grow to 12cm high.